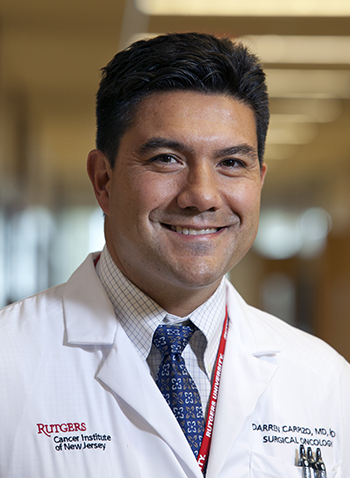 New Brunswick, N.J. – A $500,000 grant awarded to Rutgers Cancer Institute of New Jersey surgical oncologist Darren R. Carpizo, MD, PhD, will aid the work of the physician-scientist in examining genetic changes in pancreatic cancer that could lead to new therapeutic targets. The 2018 Translational Research Grant from the Pancreatic Cancer Action Network will help Dr. Carpizo further explore a biological event associated with a signaling pathway known as Netrin-1 that enables cancer cells to live. Pancreatic cancer suffers from a lack of effective chemotherapy, highlighting the urgent need for new therapeutics. Most patients (85 percent) with pancreatic cancer have locally advanced or metastatic disease (stage 4) at the time of diagnosis – meaning their tumor has spread just outside their pancreas or distantly to other organs. While surgery remains the only chance for long-term survival, more than 75 percent of patients undergoing surgery for pancreatic cancer will die of metastatic recurrent disease. Recently, new research in the science of pancreatic cancer has revealed genetic changes that are important for the survival of metastatic cells. One such biological event is activation of the Netrin-1 protein signaling pathway. Netrin-1 functions as a survival signal to cancer cells, so without Netrin-1, cancer cells die. “This is important because therapies that target Netrin-1 would in theory kill cancer cells by depriving them of this survival mechanism,” notes Carpizo, who is an associate professor of surgery and pharmacology at Rutgers Robert Wood Johnson Medical School. Carpizo and Patrick Mehlen, PhD, of the Université Claude Bernard Lyon 1, who is a co-principal investigator on the project, and their labs have shown evidence that Netrin-1 gets turned on in both mouse and human pancreatic cancer cell lines. They also show that silencing (turning off) Netrin-1 or its receptor leads to pancreatic cancer cell death and prevents the cancer from spreading. “This suggests that Netrin-1 would be a useful therapeutic target in pancreatic cancer,” Carpizo adds. The duo aims to confirm this idea in mouse models of pancreatic cancer. “There is evidence that anti-Netrin-1 therapy also makes chemotherapy work better, and we will test this idea as well in a mouse model of pancreatic cancer. We also will determine whether this treatment strategy would be best suited for patients with metastatic disease or those with early-stage disease who are candidates for surgery. I am grateful to the Pancreatic Cancer Action Network for its support of this very important work,” notes Carpizo, who was also the 2012 recipient of a Pancreatic Cancer Action Network Career Development Award funded by the Daniel and Janet Mordecai Foundation. The project period runs through June 2020.